The sun visors for the driver and the front passenger can be pulled out of their mountings in the centre of the vehicle and turned towards the doors ⇒ fig. 64 1. 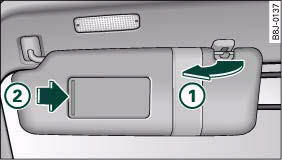 Once the sun visor has been turned towards the door you can pull it towards the rear as desired. Sun blinds are provided for the rear window and the rear side windows. – Pull out the blind and hook it into the retainers at the top of the door frame. – Press the switch ⇒ fig. 65 or ⇒ fig. 66 to extend or retract the sun blind for the rear window. – To retract the sun blind automatically when reversing, select: Function selector button CAR > Windows > Automatic rear blind > on. If you switch the Automatic rear blind function on in the sound system or MMI*, the raised sun blind will be retracted automatically when reverse gear is engaged ⇒ page 55. In this way, the rear blind will not obstruct your vision when reversing. The rear blind returns to its raised position when reverse gear is disengaged and the vehicle is driven forwards at a speed above about 15 km/h. The current setting is automatically stored and assigned to the remote control key. If the rear blind was rolled in automatically when reversing and then the ignition was switched off and on again, the blind will not roll back out again when you select a forward gear and the speed exceeds 15 km/h. You will then have to press the button « on the centre console to extend the blind again. 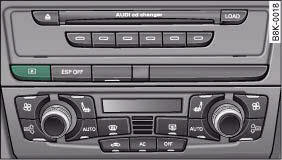 The sun blind for the rear window switches off automatically when it reaches the end position. It can be made to move in the other direction before it reaches its end position by briefly pressing the switch a second time. If the ignition is turned off while the blind is still moving, it continues until it reaches the end position before switching off. • An overload cut-out may be activated if the sun blind is operated repeatedly. There will then be a short delay before the blind can be operated again. • As the material of the sun blind is less flexible at low temperatures the electric actuator is switched off when the temperature in the car is below -5°C. 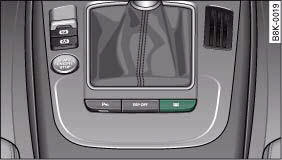 The blind can only be operated when the temperature in the car's interior rises above this level.